ISBN 9790006530007. 27 x 19 cm inches. Language: German/Italian. Translation: Eberhard Schmidt. Text: Haym, Nicola Francesco. 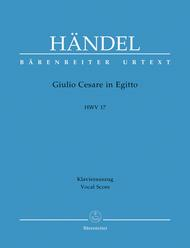 During Handel's lifetime Giulio Cesare in Egitto was among his most successful operas. Today it is still one of the most frequently performed, owing to the rich variety of its scenes and its remarkably inventive arias and ensembles, which embellish the underlying affects with virtuoso aplomb. 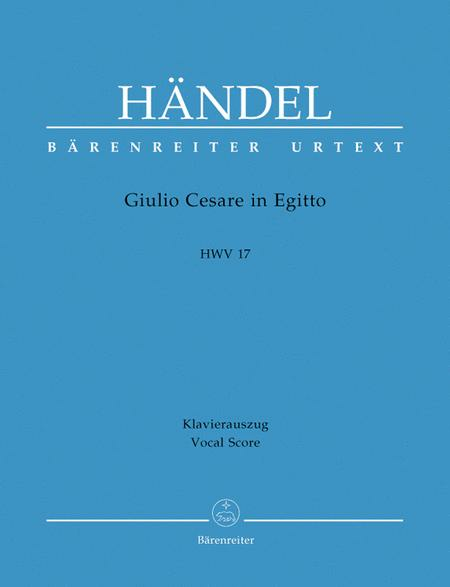 The piano writing contains the musical numbers from the main version and observes the editorial decisions in Zschoch's volume, thereby making it possible to prepare authentic performances of what is perhaps Handel's most popular opera. Uhrtext, need I say more? Good, clear, readability. Cesare as a countertenor, etc . . . the realizations are nice as in "Cara speme." Italian over Deutsch, o.k., but not a translation.